Powerlifter Emily Lloyd Whittington is targeting a world title after claiming a clutch of titles and records just a year after taking up the sport. The 20-year-old from Newtown in Powys, who is a student at Manchester University, won four gold medals representing England at September's Commonwealth Championships. Whittington broke three English and one British record in South Africa. "The goal is to compete at the World Championships," Whittington said. "I would like to get a world title or a podium place. "The world records are a bit higher than the British ones because you have the Americans and other countries competing. "It would be nice to be able to do the European and World Championships, but it is very costly." The former pupil at Ysgol Dafydd Llwyd in Newtown and Llanfair Caereinon High School student competes in the 63kg junior class and claimed the Under-23 title at the 2017 All England Powerlifting Championships in May. 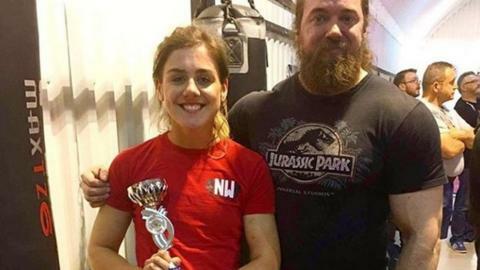 Whittington's next competition is the Junior British Powerlifting Championships in Motherwell in November where success will put her in contention for the World Powerlifting Championships in Canada in June 2018. Powerlifting is not currently an Olympic sport, although competitors are hopeful it will one day be included alongside weightlifting.